This is a simple and delicious salad that is a cinch to throw together. It’s a refreshing meal for a hot summer day. I got this recipe from the food demo booth at Publix. They were handing out samples of this salad. I got all the ingredients and made it last night when I got home. So good!! Chop artichokes and onion. 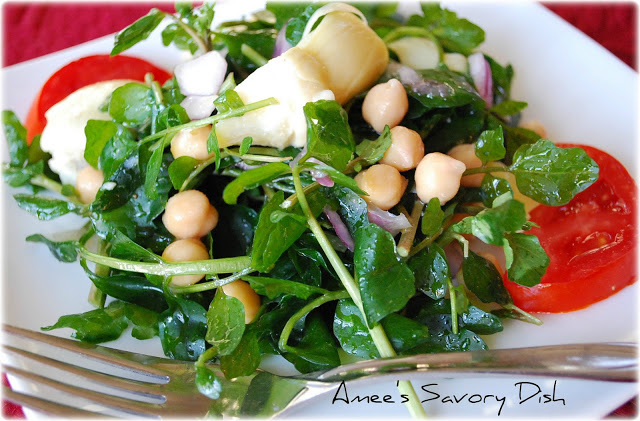 Combine arugula(or watercress), chickpeas, onions and artichokes. Whisk together vinegar, oil, salt and pepper until blended, add to salad. Toss and serve. a simple but healthy gluten free, meatless salad with arugula, artichoke hearts and chickpeas, tossed in a simple vinaigrette dressing. Combine arugula and/or watercress, chickpeas, onions and artichokes. Whisk together vinegar, oil, salt and pepper until blended; add to salad. Toss and serve. This does look simple… and delicious! Thanks for sharing.